This year, which by a happy coincidence, is the Silver Jubilee of Her Majesty Queen Elizabeth 11, sees the seventy-fifth anniversary of Hitchin Thespians who, over the years, have become something of an institution in the town and, indeed, in the district. During that time an unknown number of enthusiasts have devoted their leisure to providing entertainment, encouraging music of all kinds and raising several thousand pounds for local charities. The Society traces its origin to a local performance arranged by Mrs Waiter Carling and Miss Gane, and given by ladies only, of Coleridge Taylor's 'The Gitanos', following which, on February 21 st, 1 903, a decision was taken, at a meeting of people interested in continuing such activities, to form the Hitchin Amateur Light Opera company. This meeting was held at 'Birchfield', Verulam Road, then the home of the Rev. Gainsford, Vicar of St. Saviours' Church. Those present, the Rev. G. B. Gainsford, Miss Gainsford, Mr and Mrs R. C. Swaine, Miss Pepper and Miss Gane, appointed themselves the first Committee. The first production, 'The Sorcerer', was presented on Wednesday, 10th February, 1904, at the Town Hall. Two performances, at three o'clock and eight o'clock, were given. The producer, Mr. R. C. Swaine, took the title role and the conductor was Mrs Waiter Carling. Expenses were not high, for most of the performers provided their own costumes, and the company sent the sum of seventeen guineas as a gift to Hitchin Hospital. Encouraged by their success, they selected a more ambitious show, 'The Yeomen of the Guard', which was presented in the following February. Mr Swaine again produced, the conductor on this occasion being Mr William Wurr, then organist of the parish church at Stevenage. The scenery on this, and subsequent occasions, was painted by Mrs Gainsford. The production was highly praised, though the local press, not altogether convinced of the musical prowess of the performers, suggested that they might do better to confine themselves to purely 'dramatic pieces'. Nothing daunted, the Society, changing its name for the sake of brevity to Hitchin Thespians in March, when definite rules were drawn up and adopted, embarked upon a second production in 1905. The choice was a little-known show, 'The Mountebanks', by Gilbert & Cellier. The performances took place on November 6th at 8 p.m. and on November 7th at 6.45 p.m. The early hour of the second performance was fixed to enable an elderly lady supporter to catch her train home! Perhaps the most notable thing about this production was the accounts, which showed a startling balance of £1.1s.0d. 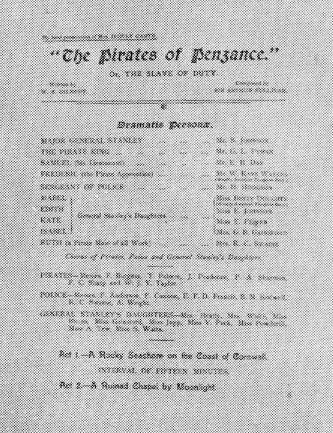 Mr Swaine having left Hitchin, a change of producer took place in 1906, when Mr P. A. Sharman was responsible for the November production of 'The Pirates of Penzance'. Temporary deficiencies in local talent made it necessary to import both male and female leads in this show. Even in these early days, it was considered wiser to do this rather than lower the all-round standard of the production. The practice has continued, despite its critics, though, happily, the Society has provided its own principals in almost all its productions in recent years, notwithstanding the ambitious nature of some of them. 'The Pirates' was performed on a Town Hall stage lit for the first time by electric light, the cost of the installation having been partly defrayed by the Society. 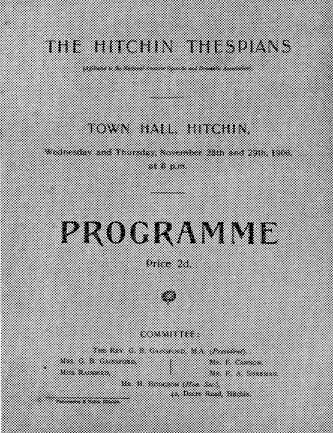 'Stage specially illuminated for the performance with Electric Light by the Hitchin Electric Supply Corporation', announced the programme proudly. The auditorium continued to be lit by gas, but the new arrangements came as a blessed relief to players accustomed to the roasting heat of gas-lit footlights and battens. Some idea of the conditions under which they had hitherto performed may be gained from the words of Mr P. A. Sharman, who wrote in his reminiscences: "On representations being made to the Town Authorities, they placed a thermometer on the wall to see if there really was any heat The mercury promptly went up to the top and burst the glass! No wonder the performers in those days warmed up to their subject." Another welcome innovation at this time was the provision of refreshments for the cast in the cellar under the stage.